I read some of Zach’s journals today, after my ‘legacy’ post. I found I could read them without an inordinate amount of sadness. I’m a little more removed from the last time I was reading them seven or eight months ago. Today I wasn’t dwelling on the content so much as just appreciating that they’re there and marveling at the spirit that wrote them. I’m not going to quote anything today. It’s either a lot or nothing and today will be nothing. I still think occasionally about the state of my apartment or bedroom when I go out for the day and wonder if I never come back what people might think about me. Those of us living have to go on living, though. We can’t always be thinking about our deaths. It will come when it comes. I’ll call it the lesson of Rosalie. Live now! It seems odd that I do not find this word in the list of tags on the front page. Is it a comprehensive list? Or just the most used? I don’t know, but I thought I had written on the idea at least once before. This blog is part of my legacy, that which I am remembered by. My legacy also includes other writing in my computer, in my spiral notebooks, and in my letters to others if they have saved them. My photographs, my books, my recorded voice will all contribute to the legacy I bequeath to my children and their children and hopefully beyond that. Most of what I just enumerated is private. This blog is emphatically not private so I approach what I write here differently from other places. This is part of my public legacy: my relationships with people outside of my family, both personal and working. The content is similar, though, in the respect that it is all me. Seemingly out of nowhere, Zach has been back at the front of my attention. I think it’s because I’ve been on the roads a lot in the last couple of days. Actually, everything has been pretty nominal except for yesterday. Yesterday was Tom Kent‘s CD release party in Roseville. I was going to go anyway – I had arranged for the day off – but he called me in the morning and said he wanted me to play on two of his tunes from the CD and to please bring a guitar and bass. I had played on those tunes for the CD but had missed the rehearsals for the live show. When that happened I told Tom I would just show up to the party to support him but wouldn’t play. Anyway, that’s another story. What is germane is that I drove 280 miles yesterday including a significant portion on two lane roads. Today I just drove to work at Davies and coming home a few minutes ago I got to witness several drivers driving faster than they needed to: quick lane changes, tailgating etc. How do I know they were going faster than they needed to? In almost every case I caught up to them at the next light and they were sitting calmly waiting for the light. All I could think of was, why are you risking the life of an innocent pedestrian or bicyclist for that 10% of the time when you get through the next light. And then what? You’re 30 seconds ahead of where you would otherwise be. With the anniversary of Zach’s death coming up I have been thinking about some posts I want to do. One will be titled ‘that awful night’ and describe my experiences that night. Some others will be the statements made to the police by the drivers and witnesses. The last several months I have let the whole thing go but I am not finished with the legal system. I am gathering my strength to read those statements again and analyze them carefully. I have an idea what they will show but I will not say now. It may be that it will be different from what I expect. There is a 4 year statute of limitations on criminal charges. He doesn’t play his TV loud any more but he must be watching it because I hear him laugh at it all the time. He has this moronic-sounding ‘ah-HUH’ that leaks through the floor seemingly whenever he’s home. I still hear him bashing and crashing in (presumably) his kitchen but he’s been able to restrict that to reasonable hours. I have noticed that my cabinets and drawers are old and pretty noisy so I try to be careful with them in the dark hours. I read Ursula K. LeGuin’s Earthsea trilogy years ago and liked it enough to keep it in my library. I’ve read it once or twice more since then. She wrote a fourth book in the same story line that I read but did not care for as much. Regardless, when I saw her name on a book titled Tales from Earthsea, I picked it up immediately. For a dollar how can you go wrong? Even if we are present at some historic event, do we comprehend it – can we even remember it – until we can tell it as a story? And for events in times or places outside our own experience, we have nothing to go on but the stories other people tell us. Past events exist , after all, only in memory, which is a form of imagination. The event is real now, but once it’s then, its continuing reality is entirely up to us, dependent on our energy and honesty. If we let it drop from memory, only imagination can restore the least glimmer of it. If we lie about the past, forcing it to tell a story we want it to tell, to mean what we want it to mean, it loses its reality, becomes a fake. To bring our past along with us through time in the hold-alls of myth and history is a heavy undertaking; but as Lao Tzu says, wise people march along with the baggage wagons. LeGuin has a larger, world history in mind but her words resonate with me for the events of last November. Humankind is just a tiny blip in the context of the universe, but for us it is all we have. We must hold our memories true and pass them on. There is nothing more. In a lighter mode, I want to expand a little on the kvetching I did about my trip to Denver. Dad’s on the downhill side of his life. His body and mind are not what they used to be. I still treasure him and value my time with him. As a memory of better times, I want to post this photo which as always been one of my favorites. 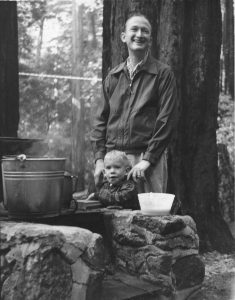 I don’t remember ever asking but I’m pretty sure Mom was the photographer in Big Basin in 1957. There’s lot on my mind as usual so choosing a topic this morning is hard. The first thing that comes to mind is Jeremy. His and Ashley’s wedding anniversary was yesterday and I was able to have a Skype session with them. Rosalie has a little cough but was in good spirits. Jeremy just got back from a quick trip to Seattle for a job interview with a suburban Seattle department. He would still be a first responder but hopefully not be surrounded by so many ignorant people. He was particularly hopeful since this fire department spends a lot of time doing outreach in the community which would fit well with his experience and outlook. A couple of months ago we were talking and he expressed fear that so many of his colleagues were Trump supporters who were making noises about the election being rigged to the detriment of their guy. He characterized them as rural, poorly educated white people with guns. He had just gotten back from a nearly all night vigil near the state capitol where some demonstrations were going on. I think he had a vision of more of the same in the months to come. Now Trump actually said in a national forum that he will not accept the results of the election if he loses. This is more real. The situation is developing as I write this but it worries me more since Jeremy saw it coming. One of the things I’ve been saying for years has been that the terrorists won. We have to go through elaborate security checks now to get on airplanes and many other aspects of our lives are subject to surveillance. Overseas, our military is killing people in the name of national security with seeming impunity. Now here at home the ideals that we thought were American are being frittered away by a combination of attacks on legislation by the 1% and general apathy. Our tendency to view politics as a contest to win has allowed us to only look at the entertainment aspects of this Presidential campaign. We are all poorer for having a buffoon like Trump representing a national party. I’ve been thinking I want to set up a static front page. Now, there is all this web site jargon that I’m not too good with so I’m not sure that will do what I really want to do which is to introduce myself and talk a little about why the blog is named after Zach. I’m hoping I can still have at least a couple of posts on the front page as well. I don’t really know how people are reading the blog. Give me feedback, people! Do I have regular readers who are keeping up? When people come upon the site now with nearly 4 months of posts are they looking through the tags or the categories to find something new? For myself, I’m not ready to go back through my writing yet. I’ve poked around enough to know that the site is working well enough. I’m finally starting to get the feeling that I might have reduced my work schedule enough to really work on this though so here’s my first warning. Where was I? OK. Friday morning. We left the stone cutter’s and headed back out 44th Avenue to Mt. Olivet Cemetery. 44th runs parallel to I-70m that we had seen backed up earlier and the traffic coming towards us was solid for two miles. At 11:30 in the morning! Dad wanted to confirm his burial arrangements at Mt. Olivet. 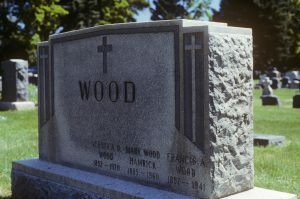 There is a large stone there with several Wood’s buried there. 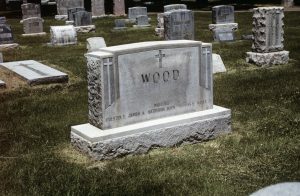 Mom and Dad have decided that they want to be buried there. It’s a little hard to see in the second photo but there is space for two names on the far end. How exactly to fit Mom and Dad’s names there is what we discussed with the stone cutter. After Mt. Olivet, Dad wanted to see the Thaler house on Vrain. Patty is living there but has not been well so we only drove by. There are huge duplexes on both sides of that little house now! Who allowed that zoning variance? Mom and Dad wanted to get together with Dad’s high school friend Ginger. (Urrk, can’t remember her last name!) After some negotiating, we agreed to pick her up at her house and go out to lunch. This is where Dad got the freeway exit right and I didn’t. We were a little early until the detour . . .
After a nice lunch and visit I asked Dad if we could drive by the house he grew up in. ‘Grandma Flynn’s house.’ He wasn’t wild about the idea but I persisted. It was pretty much right on the way back to the hotel, assuming we didn’t go on the freeway, which I didn’t want to do. It was around 3:30 by now on a Friday. So we worked our way through Denver city streets until we came to the house on 1st Avenue. There was a parking space right across the street so I pulled in and told Mom and Dad I just wanted to take a good look and a couple of pictures. This I did but as I was getting ready to leave a woman and a boy came riding up on bicycles and she went up to the side of the house to put away her bike. I thought she might have seen me snooping around so I thought I would explain myself. She turned out to be thrilled that we had a connection to the house. She and her husband had lived there since 1993. She insisted that Dad come out of the car and invited us in to look around. I didn’t remember the inside at all but of course Dad did and so did Mom. They declined the invitation to go upstairs. After many thanks we said goodbye and continued back to the hotel. The next day we had no plans beyond going to Tim Flynn’s that evening. I looked up Lawson and found that it was only 35 minutes from our hotel. Lawson is where my great grandfather Thomas Bernard is buried. Mom and Dad declined the invitation to go there with me. 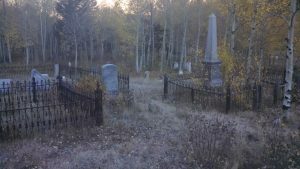 I got going early and got to the cemetery around 8:30 am. It was considerably colder than Denver there at 8500 feet! It’s a pretty spot but I noticed the freeway noise (I-70) for the first time. Unrelenting. I went on into Georgetown for a cup of hot chocolate and a muffin. The car helpfully told me the outside temperature was 36 degrees! Back to the hotel for an afternoon of resting and watching football. At 5 we headed out for Tim’s. Tim had moved back into the house he grew up in and recently finished remodeling that he wanted to share with the family. Tim and Debbie hosted us, Patty Thaler, Jackie and her husband Dan and their sons Sean and Brian, Michelle and her husband Steve, Mary Helen and her daughter Melissa and her husband Silvio. We all toured the house and had a fine time sitting around chatting. Patty has a very serious lung problem so had a tank of oxygen with her at all times. We aren’t what I would call close to our Denver relatives but we always enjoy each other when we get together. Jackie and Patty had invited us to join them Sunday morning at their church. I was ready to go but Dad nixed the idea in the morning. Actually, he nixed just about every idea Mom and I came up with for how to spend the day. Finally he agreed to go see a movie so we went to see ‘Sully’. After that we went to the Denver Museum of Nature and Science. We had lunch there first but when we finished at 3:30, Dad didn’t want to go into the museum. He was anxious to be at the airport. For a 9 pm flight. OK, let’s go. Before heading to the airport, I did drive slowly through City Park, where the museum is located. On our way out we passed an imposing building that Dad said was Denver East High School and that he had attended there one summer for a class that St Francis didn’t have. Well, that’s cool! From there I spotted the dome of the Capitol building so I drove down by there and then through the downtown area. I sort of half heartedly looked for Union Station but failed. I guess I was ready to go home too. Going to the airport, I drove through city streets again just to look around. The day was lovely but taking a walk was not in the cards. We got to the Avis place at 4:45, dropped off the car with no hassle, got through ticketing and security and to the gate by 6:30. Once on the plane, there was a delay for reasons never explained. We left about 20 minutes late. Arrived SFO 11:15, got back to pick up Mom and Dad with the car at midnight, got to Santa Clara about 12:40, turned right around and headed home in my car, arrived in Pacifica at 1:30 and couldn’t sleep. Urrr. Ibuprofen to the rescue. Attained sleep about 2:30 but had to get up at 6 for an 8 am call at Davies which lasted until 2 am.